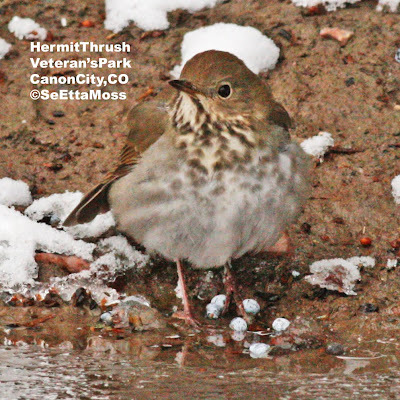 I found this migrating Hermit Thrush in Veteran's Park in Canon City,CO this morning. 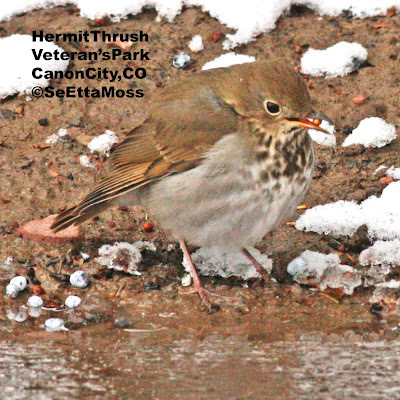 Actually there were two Hermit Thrush but the second bird was more secretive, a characteristic for which this species is known. However this bird came out into the open and foraged within 15-20 feet of me. Twice it flew under my car which put it quite close to me but out of sight. The second bird stayed in the juniper trees next to the park road. 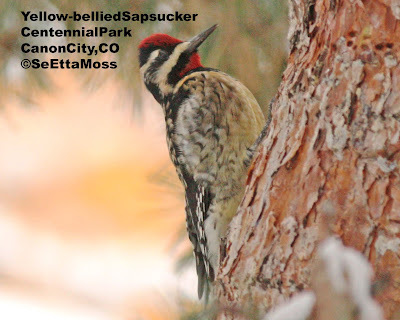 Canon City, CO has hosted 1 or more Yellow-bellied Sapsuckers very winter since December,2003. I have found them in mid-October in some years and have been looking for them for about 2 weeks but without any sign (no fresh sapwells) until I spotted this male adult today. 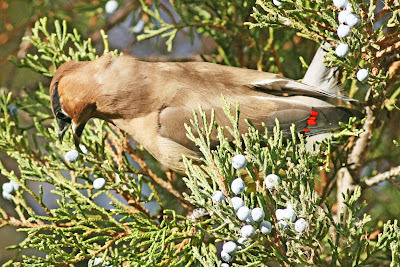 He was in a pine tree in Centennial Park, one of several winter hot-spots that this species, as well as some Williamson's and a few Red-naped Sapsuckers in Canon City. I checked two other "sapsucker hotspots" but didn't find any more sapsuckers so this is the first to return. Much of Colorado has been in the grip of a significant snowstorm for the past 3 days. 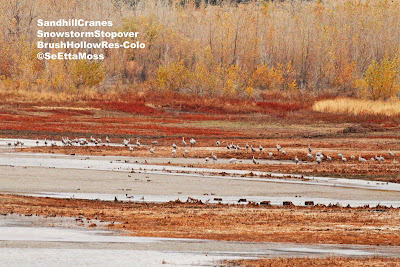 I took this pic of part of a flock of 80-90 Sandhill Cranes that were using Brush Hollow Reservoir northeast of Canon City for a vital stop-over. Though we got 4-6 inches of snow in the Canon City,CO area from this storm, it stayed around freezing so some melted and the roads remained mostly wet. Further west and north, where much more snow fell and temps were lower the conditions were pretty nasty. "It Takes Two To Tutor A Sparrow"
"It may take a village to raise a child, and apparently it takes at least two adult birds to teach a young song sparrow how and what to sing. In the first study conducted in the field to examine how juvenile song birds learn their repertoire, University of Washington researchers have learned that eavesdropping on the singing conversations between two adult sparrows appears to be a key event in song learning. The results are being published Oct. 21 in the online edition of the Proceedings of the Royal Society B. The Royal Society is the British version of the National Academy of Sciences. 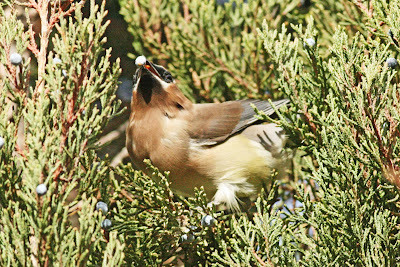 I caught the bird in the top pic just as it reached for a juniper berry. Some of the birds, including this one, seemed to believe they were hidden from me by the juniper branches or foilage and continued their feast as though I wasn't there.